This article presents the results of a study exploring travellers' preferences for middle-distance travel using Q-methodology. Respondents rank-ordered 42 opinion statements regarding travel choice and motivations for travel in general and for car and public transport as alternative travel modes. 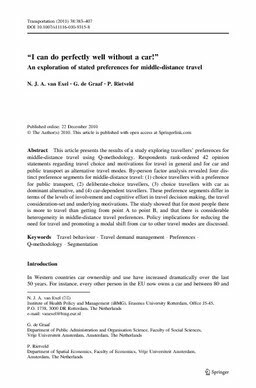 By-person factor analysis revealed four distinct preference segments for middle-distance travel: (1) choice travellers with a preference for public transport, (2) deliberate-choice travellers, (3) choice travellers with car as dominant alternative, and (4) car-dependent travellers. These preference segments differ in terms of the levels of involvement and cognitive effort in travel decision making, the travel consideration-set and underlying motivations. The study showed that for most people there is more to travel than getting from point A to point B, and that there is considerable heterogeneity in middle-distance travel preferences.